Click on the Galleries tab in the Talent Profile. IMPORTANT: make sure the Gallery you are loading files into supports the media your are trying to upload. Image files only work in an Image Gallery, audio files only work in an Audio Gallery and video files only work in a Video Gallery. Click on the Gallery you wish to add to. Click on the Upload button on the bottom right. 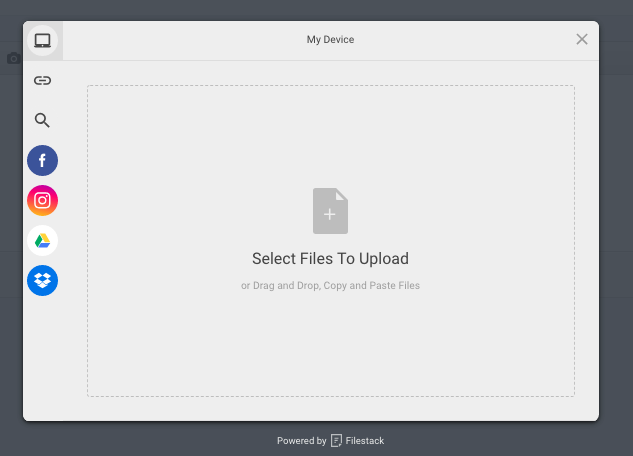 A pop up window will open, enabling you to choose where you are loading the file from. To change where you are getting the file from, hover your mouse over the symbols on the left and you can select the origin of the file. Once you have selected your file/files, click Upload on the bottom right. A Processing Images alert will appear in the top right of your window while the files are being uploaded. This alert will dissappear once the file/files are uploaded, and you will see them appear in the Gallery. 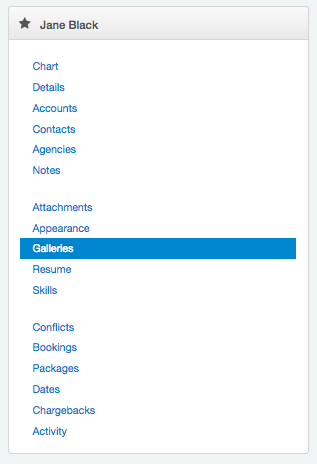 You can sort the files in the Gallery in the order you would like them to appear by dragging and dropping them. 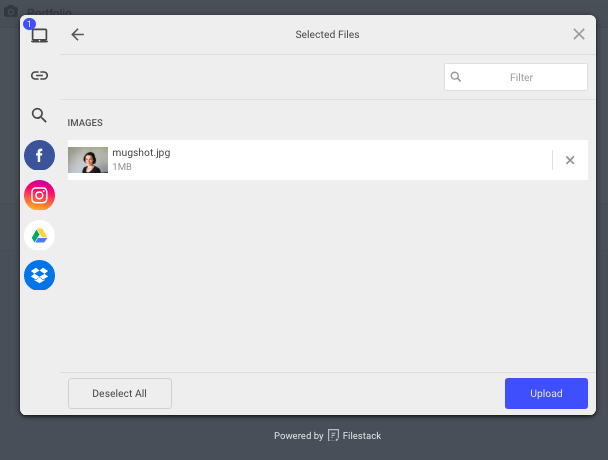 You can delete files at any point by clicking on the small box bottom right of the image, and going to the drop down in the top right of the window and choosing Delete Selected.